Dr. Anderson's. laboratory at Oregon State University (http://emt.oregonstate.edu/users/kim-anderson; and in the Oregon State University Superfund Research Program (http://superfund.oregonstate.edu/core_d; http://superfund.oregonstate.edu/project-4-bridging-superfund-site-based-bioavailable-extracts-biology) has been in the news since a 2014 article in Environmental Science and Technology (Silicone Wristbands as Personal Passive Samplers: Steven G. O’Connell, Laurel D. Kincl, and Kim A. Anderson; Environ. Sci. 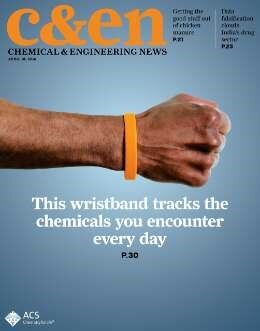 Technol., 2014, 48 (6), pp 3327–3335) first described the lab’s work using silicone wrist bands to capture the wearer’s exposure to chemicals during the course of day to day life. A more recent article in Environmental Research (“Using silicone wristbands to evaluate preschool children's exposure to flame retardants”; Molly L. Kile, Richard P. Scott, Steven G. O’Connel, Shannon Lipscomb, Megan MacDonald, Megan McClelland, and Kim A. Anderson; Volume 147, May 2016, Pages 365–372) detailed the results of an OSU wristband study on Oregon preschoolers intended to determine whether the children had been exposed to flame-retardants. An analysis of the wristbands showed they had been exposed to polybrominated diphenyl ethers (which are no longer produced in the U.S.) and organophosphates. The Anderson lab is currently looking at ways to further develop the wristband sensors. In general the Anderson Lab optimizes, develops and demonstrates passive sampling devices and other surrogate techniques for measuring bioavailable contaminants and compares the passive wristband samplers with conventional measures in real-world epidemiological studies with health outcomes. Additionally, they develop bio-analytical tools, methods, and approaches to generate desirable objective data concerning exposures of many contaminants including unmonitored contaminants. They are focused in the field of environmental forensic chemistry which entails the application of chemical concepts to the interpretation, distribution, speciation, and bioavailability of chemicals in the environment. The Anderson group has special interest in persistent, bioaccumulative, chemicals with potential long term biological effects and toxicity. The Anderson group studies the bioaccumulation and movement of environmental chemicals between water, air, and sediments. The long term goal is to better understand the extent of human exposures to environmental contaminants and their adverse effects on living organisms.